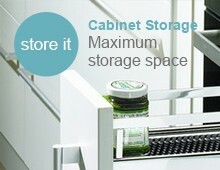 A practical solution for narrow cabinet's, creating pull-out storage for bottles, herbs and spices. 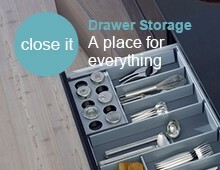 Blum’s proven quality of motion is also prominent in its narrow cabinet concept. 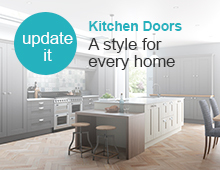 The pull-out has a feather-light glide and closes softly and effortlessly with soft-close - even when heavily laden. 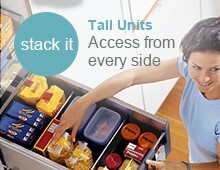 Please Note - Cabinet and drawer fascia are not included. 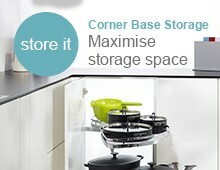 Cabinets require a minimum installation internal depth of 453mm, Drawer heights Top: 98mm Bottom: 220mm. Cabinet sides to be constructed of 18mm thick material. 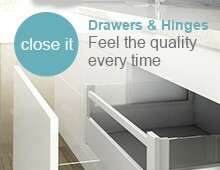 Bespoke drawer manufacture service for alternative widths also available.